Product #60648 | SKU 6-218 | 0.0 (no ratings yet) Thanks for your rating! This distributor splits one D-tap outlet into 4 P-tap, 2 USB, and one AUX outlets. 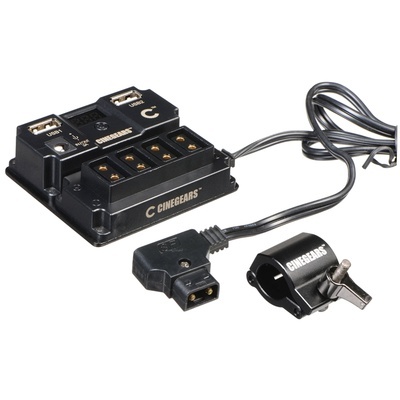 The Cinegears Compact D-Tap Power Distributor allows you to tap in to P-tap power safely. This distributor splits one D-tap outlet into 4 P-tap, 2 USB, and one AUX outlets, while stabilising the current and providing in-built surge protection for your gear; keep your gear powered and protected. An LED display shows current voltage output for extra peace of mind. The distributor can be mounted with the included bracket, or with the included Velcro strap. A key piece of common feedback from the film community regarding working with P-tap power sources is that using an aged or overworked P-tap power source runs the risk of harmful power surges. Don't run this risk: use the Cinegears compact power distributor.